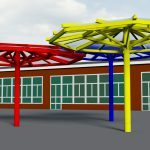 We are delighted to announce that our new style umbrella canopy has now been added to the Twinfix portfolio of canopies. 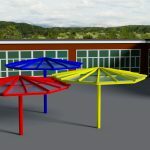 What better way to make an eye-catching addition to a playground or outside recreational space than with one of these permanent freestanding structures? 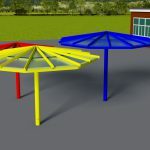 In addition to providing a useful sheltered area, they also make a fun and attractive outdoor feature. With one central post there is plenty of usable space underneath for outside learning, play and socialising. Our robust powder coated aluminium frame will not rust and you can choose from a range of bright and vibrant colours to fit with your environment. The glazed roof panels are available in a variety of coloured polycarbonate and also offer vital UV protection. Standard sizes are 2 meters, 3 meters and 4 meters diameter. Call our sales team for a quote. If you’d prefer a physical copy please just get in touch by phone on 01925 811311 or through the website using our Contact Us page and we’ll get one out to you.